The main advantages of MRI over all other imaging modalities are the lack of ionizing radiation and the high soft-tissue resolution. T1-weighted images are preferred for outlining morphology because of the greater latitude and better visualization of disk tissue relative to the osseous anatomy of the condyle. T2-weighted images are obtained routinely to document the presence of joint effusion and inflammatory changes in the joint capsule. The purpose of this study was to investigate the relationship between bone marrow edema and osteoarthritis of the mandibular condyle in a group of symptomatic patients using MRI. Accordingly, the null hypothesis (H 0 ) was: There is no significant association between bone marrow edema of the mandibular condyle and temporomandibular joint (TMJ) osteoarthritis. This study comprised consecutive temporomandibular dysfunction patients referred to the Department of Oral and Maxillofacial Radiology, University of Connecticut School of Dental Medicine, from January 2005 to December 2011. All patients presented with at least one of the following TMJ clinical features: Pain, clicking, locking, or restricted jaw movement. This study was approved by the Institutional Review Board (IRB) of the University of Connecticut Health Center (IRB number 11-158-1). For MRI techniques, all patients were examined with a 1.5-T system (8-truly in-dependent-channel radiofrequency head coil; Siemens, Magnetom Avanto 1.5 T, Erlangen, Germany). 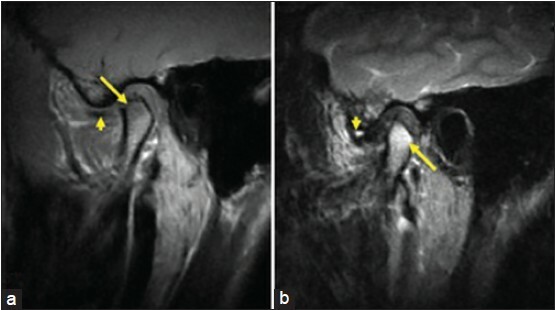 Sagittal oblique imaging of the TMJ was acquired with the use of turbo spin-echo (TSE; half-Fourier acquisition TSE) T1-weighted (in open- and closed-mouth positions) and T2-weighted (in closed-mouth position) sequences. Coronal imaging was acquired with TSE T1-weighted sequences in closed-mouth position. All MRI studies were static and used a stepped plastic bite-block placed between the upper and lower incisors to control the mouth-opening position. The gradient pulse sequences and parameters were as follow: For T1-weighted images: Field of view (FOV)-14 cm, slice thickness-3.00 mm, slice gap-3.30 mm, TR -770 ms, TE-12 ms, flip angle (FA)-150, matrix 320 × 256, acquisition mode two-dimensional; for T2-weighted images: FOV-14 cm, slice thickness-3.00 mm, slice gap-3.30 mm, TR-3,000 ms, TE-65 ms, FA-150, matrix 256 × 204, acquisition mode two-dimensional. The imaging data were analyzed on workstation of Philips IntelliSpace PACS Enterprise (Philips Healthcare, Amsterdam, The Netherlands). Bone marrow edema was defined by the presence of a hypointense signal on T1-weighted images and a hyperintense signal on T2-weighted images in the mandibular condyle in at least one sagittal section. On T1-weighted images, diagnosis of osteoarthritis was defined by visualization of flattening, surface irregularities, erosion, and/or osteophytosis in the condylar or temporal component of the joint. The association of osteoarthritis with bone marrow edema was evaluated by Chi-square test, and P < 0.05 were accepted as statistically significant. Among the total number of 108 TMJ-MRI exams, 12 patients were excluded for poor image quality or prior TMJ surgery. The final study population comprised 96 patients (192 joints), of whom 80 women and 28 men. Their ages ranged from 18 to 73 years (mean, 42 years). Osteoarthritic changes were seen in 142 (73%) joints. Bone marrow edema was encountered in 116 (60%) joints [Table 1]. The remaining 76 joints were used as a control group. Hence, the control group was simply selected on virtue of absence of osteoarthritis. Concurrent presence of bone marrow edema and osteoarthritis was encountered in 100 joints [Figure 1]. Chi-square test showed significant association between bone marrow edema and osteoarthritis (P <0.0001); thus, the null hypothesis was rejected. Several MRI studies have reported bone marrow abnormalities, in terms of edema and avascular necrosis, of the femoral head. , Therefore, it has been postulated that similar conditions could occur in the TMJ. ,, Larheim et al. used core biopsy to document that edema and osteonecrosis may occur in the marrow of the mandibular condyle. They suggested that osteoarthritis may develop secondary to bone marrow edema and/or necrosis in the mandibular condyle. The prevalence of TMJ osteoarthritis reported in the literature is highly variable. This study has shown fairly high prevalence rate of osteoarthritis (73%); however, it was based on symptomatic subjects. Osteoarthritis has been described as a painful TMJ condition. However, it is diagnosed in a sizable proportion of asymptomatic older individuals. The discrepancy between imaging findings and patient symptoms indicates the need for a comprehensive clinical examination to determine which imaging findings are clinically significant. This study shows that abnormal bone marrow signal is more frequently seen in osteoarthritic joints. Such an observation has been reported in other studies. Authors have described the frequency of osteoarthritis in TMJ with bone marrow edema as ranging from 58.8% to 59.5%. , These findings were fairly consistent with my result (52%). Emshoff et al. suggested that the MR imaging findings for TMJ bone marrow edema are related to those of osteoarthritis. However, their results are inconsistent with findings in previous studies that showed incidence of bone marrow edema in patients with TMJ dysfunction ranging from 2.5% to 6.5%. , The inconsistent results may be explained on the basis of the studies were conducted without use of meticulous selection and interpretation criteria. The development of osteoarthritis secondary to bone marrow abnormalities is not clearly understood. Bone marrow edema has been suggested as a diagnostic predictor of TMJ osteoarthritis. The small size of the TMJ, in addition to the structure and thinness of the articular soft tissue covering may facilitate early development of secondary osteoarthritis subsequent to bone marrow edema in the mandibular condyle. However, the same finding appears to hold true for the other synovial joints. Multifactorial case-control studies using specific imaging criteria are recommended to further investigate the relationship of TMJ osteoarthritis with bone marrow abnormalities of the mandibular condyle. This analysis has shown that bone marrow edema of the mandibular condyle is suggestive, or probably a forerunner, of osteoarthritis. The study provides a piece of evidence about the usefulness of MRI in the evaluation of osteoarthritic changes involving TMJ. In order to improve our understanding of the pathophysiology of TMJ disorder, more histology- and imaging-based studies are suggested to clarify whether bone marrow edema is a precursor to osteoarthritis or rather occurs as a separate entity that does not essentially develop into osteoarthritis. 1. Schellhas KP, Wilkes CH, Fritts HM, Omlie MR, Lagrotteria LB. MR of osteochondritis dissecans and avascular necrosis of the mandibular condyle. AJR Am J Roentgenol 1989;152:551-60. 2. Sano T, Westesson PL, Larheim TA, Rubin SJ, Tallents RH. Osteoarthritis and abnormal bone marrow of the mandibular condyle. Oral Surg Oral Med Oral Pathol Oral Radiol Endod 1999;87:243-52. 3. Emshoff R, Brandlmaier I, Schmid C, Bertram S, Rudisch A. Bone marrow edema of the mandibular condyle related to internal derangement, osteoarthrosis, and joint effusion. J Oral Maxillofac Surg 2003;61:35-40. 4. Larheim TA, Westesson PL, Hicks DG, Eriksson L, Brown DA. Osteonecrosis of the temporomandibular joint: Correlation of magnetic resonance imaging and histology. J Oral Maxillofac Surg 1999;57:888-98. 5. Plenk H Jr, Hofmann S, Eschberger J, Gstettner M, Kramer J, Schneider W, et al. Histomorphology and bone morphometry of the bone marrow edema syndrome of the hip. Clin Orthop Relat Res 1997;334:73-84. 6. Nakamura T, Matsumoto T, Nishino M, Tomita K, Kadoya M. Early magnetic resonance imaging and histologic findings in a model of femoral head necrosis. Clin Orthop Relat Res 1997;334:68-72. 7. Wang EY, Fleisher KA. MRI of temporomandibular joint disorders. Appl Radiol 2008;37:17-25. 8. Pereira FJ Jr, Lundh H, Westesson PL, Carlsson LE. Clinical findings related to morphologic changes in TMJ autopsy specimens. Oral Surg Oral Med Oral Pathol 1994;78:288-95. 9. Sano T, Westesson PL, Larheim TA, Takagi R. The association of temporomandibular joint pain with abnormal bone marrow in the mandibular condyle. J Oral Maxillofac Surg 2000;58:254-7. 10. Lieberman JM, Gardner CL, Motta AO, Schwartz RD. Prevalence of bone marrow signal abnormalities observed in the temporomandibular joint using magnetic resonance imaging. J Oral Maxillofac Surg 1996;54:434-9. 11. Larheim TA, Katzberg RW, Westesson PL, Tallents RH, Moss ME. MR evidence of temporomandibular joint fluid and condyle marrow alterations: Occurrence in asymptomatic volunteers and symptomatic patients. Int J Oral Maxillofac Surg 2001;30:113-7. 12. Kim YM, Lee SH, Lee FY, Koo KH, Cho KH. Morphologic and biomechanical study of avascular necrosis of the femoral head. Orthopedics 1991;14:1111-6.